Lowest priced home in here!! 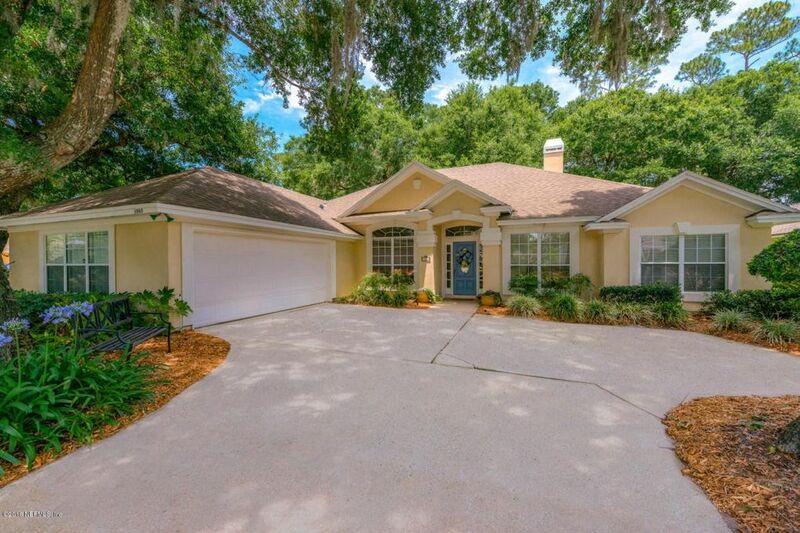 Executive style home situated on 15th green in one of Jacksonville's most prestigious country club communities! Interior Designer lives here so plenty of style & swag! One owner home that has been well maintained. Wait until you see the gorgeous landscaping & back yard, it feels like a slice of heaven with all the beautiful flowers & plants. There is a hammock & some lounge chairs so feel free to relax while you enjoy the view & watch the golfers finish out the hole yet still have privacy in your home! Foyer leads to formal living & dining areas w/hand scraped engineered wood flooring throughout...the family room has soaring ceilings and lovely wood burning fireplace and all opened up to breakfast nook & kitchen. See supplement for more info! Perfect for entertaining or watch Sunday Football! Breakfast nook has mitered window overlooking screened lanai & backyard. Three way split floorplan is perfect for company, home office or teenager. The kitchen has light cabinetry w/granite counters, bar top, fully equipped w/stainless steel appliances, food prep island w/room for more stools along w/ nice chandelier. Master bedroom overlooks back yard, spacious walk-in closet & en suite bathroom w/his and hers sinks along with soaking tub & separate shower. The secondary bedrooms are good sized and both secondary bathrooms updated. The yard is large enough for Olympic size pool! The stainless steel appliances are approx 4 y/o; breakfast room can accommodate table for 8 people. Oversized garage has room for golf cart, stand alone freezer and work space. For the gardener or someone that just appreciates pretty flowers - there are established perennial flowers: Hydrangea, Agapanthus, Mexican sage, African Iris and Margarita Daisy. In addition, sprinkler sys w/irrigation meter, security system, transferable termite bond and one yr home warranty, 2-10 $540.Residents have access to 6000sf fitness center, pool and meeting area at front of neighborhood. You may take advantage and join the many other clubs offered at an additional cost. Queen's Harbour provides its Members with the best of all worlds including the surrounding freshwater yacht basin and intracoastal waterway. The beautiful low country clubhouse, with its portico and sweeping verandas, combines Florida elegance with casual informality. Attractively positioned to overlook the lush natural surroundings and the 76-slip marina, the charming Harbour View Dining Room, The King's Tavern and The Queen's Parlor and Compass Board Room accommodate the business and social needs of our Members. Club amenities include lighted tennis courts, swimming pool, clubhouse dining, complimentary use of private meeting and dining rooms with full-service catering and event planning and exclusive social and fun-filled family events. Note: Sellers will consider replacing the roof prior to closing dependent on contract negotiations with buyer. Living room and dining room window curtains do not convey. Directions: Fm Hodges Blvd, head east on Atlantic Blvd, t/l on Queens Harbor Blvd. Once thru the gate & past clubhouse, t/l on Harrington Park Dr, t/r on Bromley Point Dr, t/l on Nottingham Knoll Dr house on right.